George Wright was one of the foremost equestrian artists of his time. He was born in Leeds, England in 1860, the son of George E. & Elizabeth Wright. The Wrights had five children, two of which (George and Gilbert) went on to become famous as artists. Not much is know of George’s early life except that he painted many of his early works “en grisaille”, leading one to believe that they were done for illustration in books, posters, magazines, etc. 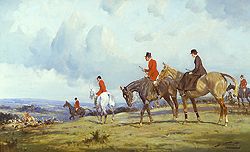 He collaborated with his younger brother, Gilbert, painting coaching and equestrian scenes that were used for calendars. In 1901 he moved to Rugby where he stayed for several years. In 1908 he moved to Oxford and by 1925 was under commission to Ackermanns in the U.K. and Grand Central Galleries in New York. He had many exhibitions at both galleries and was a successful artist. George Wright was known for his strong, well-finished hunting and coaching scenes as well as his horse portraits. He was married and had two children and by 1929 the family was living in Richmond, Surrey where they stayed until his retirement in 1939. He spent the next ten years in Seaford, Sussex where he died in 1942.